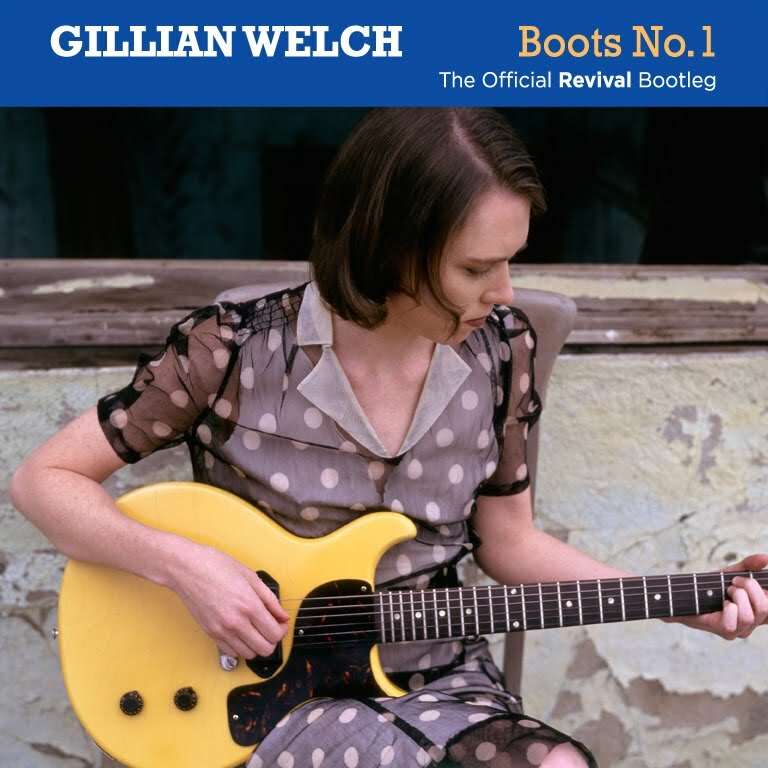 On her debut effort, REVIVAL, Gillian Welch and her long-term sideman David Rawlings entered the recording studio under the production wing of trusted musicologist T-Bone Burnett. The album that would emerge in 1996 would go on to be nominated for a GRAMMY as the Best Contemporary Folk Album. 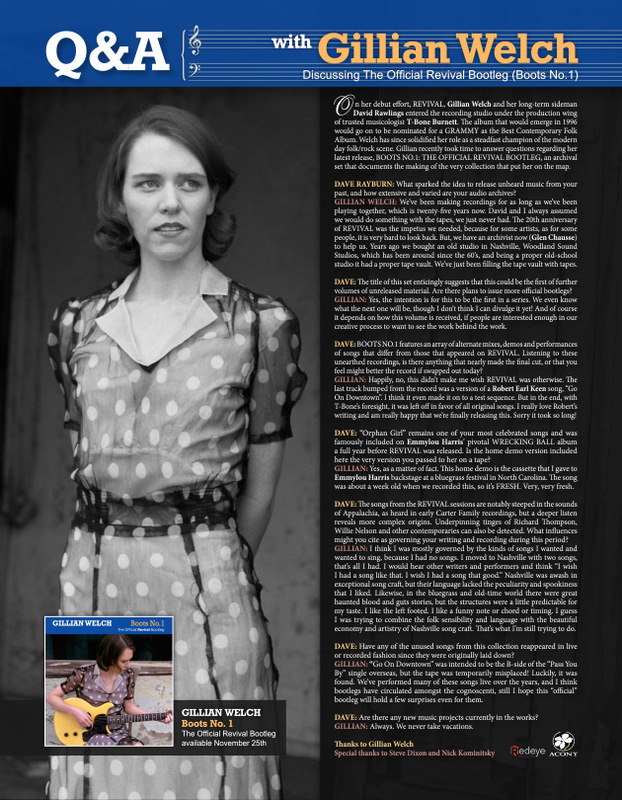 Welch has since solidified her role as a steadfast champion of the modern day folk/rock scene. Gillian recently took time to answer questions regarding her latest release, BOOTS NO.1: THE OFFICIAL REVIVAL BOOTLEG, an archival set that documents the making of the very collection that put her on the map. DAVE RAYBURN: What sparked the idea to release unheard music from your past, and how extensive and varied are your audio archives? GILLIAN WELCH: We’ve been making recordings for as long as we’ve been playing together, which is twenty-five years now. David and I always assumed we would do something with the tapes, we just never had. The 20th anniversary of REVIVAL was the impetus we needed, because for some artists, as for some people, it is very hard to look back. But, we have an archivist now (Glen Chausse) to help us. Years ago we bought an old studio in Nashville, Woodland Sound Studios, which has been around since the 60’s, and being a proper old-school studio it had a proper tape vault. We’ve just been filling the tape vault with tapes. DAVE: The title of this set enticingly suggests that this could be the first of further volumes of unreleased material. Are there plans to issue more official bootlegs? GILLIAN: Yes, the intention is for this to be the first in a series. We even know what the next one will be, though I don’t think I can divulge it yet! And of course it depends on how this volume is received, if people are interested enough in our creative process to want to see the work behind the work. DAVE: BOOTS NO.1 features an array of alternate mixes, demos and performances of songs that differ from those that appeared on REVIVAL. Listening to these unearthed recordings, is there anything that nearly made the final cut, or that you feel might better the record if swapped out today? GILLIAN: Happily, no, this didn’t make me wish REVIVAL was otherwise. The last track bumped from the record was a version of a Robert Earl Keen song, “Go On Downtown”. I think it even made it on to a test sequence. But in the end, with T-Bone’s foresight, it was left off in favor of all original songs. I really love Robert’s writing and am really happy that we’re finally releasing this. Sorry it took so long! DAVE: “Orphan Girl” remains one of your most celebrated songs and was famously included on Emmylou Harris’ pivotal WRECKING BALL album a full year before REVIVAL was released. Is the home demo version included here the very version you passed to her on a tape? GILLIAN: Yes, as a matter of fact. This home demo is the cassette that I gave to Emmylou Harris backstage at a bluegrass festival in North Carolina. The song was about a week old when we recorded this, so it’s FRESH. Very, very fresh. DAVE: The songs from the REVIVAL sessions are notably steeped in the sounds of Appalachia, as heard in early Carter Family recordings, but a deeper listen reveals more complex origins. Underpinning tinges of Richard Thompson, Willie Nelson and other contemporaries can also be detected. What influences might you cite as governing your writing and recording during this period? GILLIAN: I think I was mostly governed by the kinds of songs I wanted and wanted to sing, because I had no songs. I moved to Nashville with two songs, that’s all I had. I would hear other writers and performers and think “I wish I had a song like that. I wish I had a song that good.” Nashville was awash in exceptional song craft, but their language lacked the peculiarity and spookiness that I liked. Likewise, in the bluegrass and old-time world there were great haunted blood and guts stories, but the structures were a little predictable for my taste. I like the left footed. I like a funny note or chord or timing. I guess I was trying to combine the folk sensibility and language with the beautiful economy and artistry of Nashville song craft. That’s what I’m still trying to do. DAVE: Have any of the unused songs from this collection reappeared in live or recorded fashion since they were originally laid down? GILLIAN: “Go On Downtown” was intended to be the B-side of the “Pass You By” single overseas, but the tape was temporarily misplaced! Luckily, it was found. We’ve performed many of these songs live over the years, and I think bootlegs have circulated amongst the cognoscenti, still I hope this “official” bootleg will hold a few surprises even for them. DAVE: Are there any new music projects currently in the works? GILLIAN: Always. We never take vacations.